With a week of taking the presidential oath, Mr. Lincoln wrote Secretary of War Simon Cameron regarding Ephraim Ellsworth: “You will favor me by issuing an order detailing Lieut. 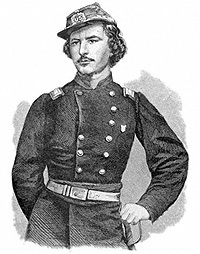 Ephraim E Ellsworth, of the First Dragoons, for special duty as Adjutant and Inspector General of Militia for the United States, and in so far as existing laws will admit, charge him with the transaction, under your direction, of all business pertaining to the Militia, to be conducted as a separate bureau, of which Lieut. Ellsworth will be chief, with instructions to take measures for promoting a uniform system of organization, drill, equipment, etc. etc. of the U.S. Militia, and to prepare a system of drill for Light troops, adapted for self-instruction, for distribution to the Militia of the several States. You will please assign him suitable office rooms, furniture etc. and provide him with a clerk and messenger, and furnish him such facilities in the way of printing, stationary, access to public records, etc. 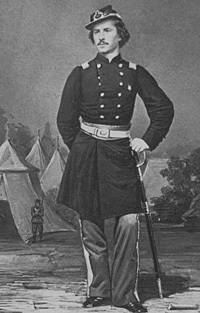 as he may desire for the successful prosecution of his duties; and also provide in such manner as may be most convenient and proper, for a monthly payment to Lieut Ellsworth, for this extra duty sufficient to make his pay equal that of a Major of cavalry.”13 The note had written at Ellsworth instigation. He had employed the President as well as Judge David Davis and New York politico Thurlow Weed to put pressure on Cameron. And even Mrs. Lincoln was employed to coerce Cameron into the appointment. The letter was written the same day that President Lincoln called up 75,000 volunteers to deal with the assault on Fort Sumter. 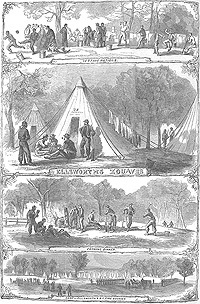 Armed with the presidential letter, Ellsworth rushed from Washington to New York City to raise a Zouave regiment from local firefighters. The tough Zouave unit quickly became a crowd pleaser in Washington – where it extinguished a fire at Willard’s Hotel on May 9. 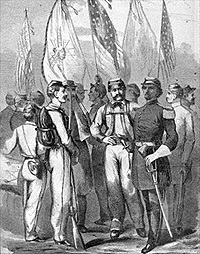 The President and his son Tad had attended the swearing in on May 7 of the Zouave Regiment in front of the Capitol. 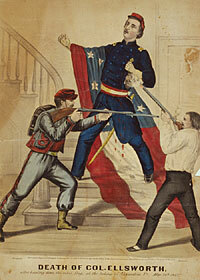 The regiment was soon detailed to put out the Confederate fires in nearby Alexandria, Virginia. Ellsworth was finally achieving the kind of recognition he sought – when tragedy struck. 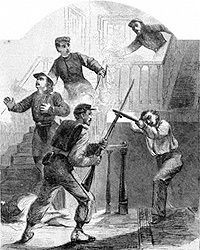 Ellsworth took his Zouave squad into Alexandria to occupy the city’s telegraph office. Along thee way, he entered a hotel to lower a Confederate flag that was flying there. Having accomplished his mission, he descended the stairs and was confronted by the hotel owner carrying a shotgun. Ellsworth was shot and killed instantly. His body was returned to the Washington Navy Yard and word of his demise sent to the White House. “Pardon us the long delay in answering your kind and sympathizing letter. It has not occurred through want of inclination to write, but from the many calls made upon our time. The fact that Elmer succeeded in gaining the love & esteem of those with whom he was associated is to us one of great joy, and the reception of a letter, expressing such sentiments, from one whom we all so much respect is highly gratifying. It would be useless for us to attempt to describe our feelings upon the receipt of the sad news of Elmers death. Although the blow was severe, how severe God only knows, yet through his goodness and mercy we are enabled to say ‘thy will not ours be done’ The sympathy of all true Christians, and lovers of that country in whose defence he perished has done much to assuage the intensity of our grief[.] We sincerely believe that God has removed him from a life of strife to one of eternal peace. He was indeed toward us all you represented him, kind loving & dutiful. Our present comfort and future happiness always seemed uppermost in his mind. But he is gone and the recollections of his goodness alone is left us. We trust he did not die in vain, but that his death will advance the cause in which he was engaged. With these few words accept our most grateful thanks for your kindness to and interest you have shown in our beloved son May it never repent you. Henry Villard, Memoirs of Henry Villard, Journalist and Financier, Volume I, 1835-1862, p. 150. Henry Villard, Lincoln on the Eve of ‘61, p. 60-61. Michael Burlingame, editor, Lincoln’s Journalist: John Hay’s Anonymous Writings for the Press, 1860-1864, p. 69 (June 3, 1861). Michael Burlingame, editor, With Lincoln in the White House: Letters, Memoranda, and Other Writings of John G. Nicolay, 1860-1865, p. 44 (Letter to Charles H. Spafford, June 25, 1861). Rufus Rockwell Wilson, editor, Intimate Memories of Lincoln, p. 239-240 (Leonard Wells Volk, Century Magazine, December 1881). Rufus Rockwell Wilson, editor, Intimate Memories of Lincoln, p. 278 (Isaac Hill Bromley, Scribner’s Magazine, November 1893). Allan Nevins, The Statesmanship of the Civil War, p. 145. 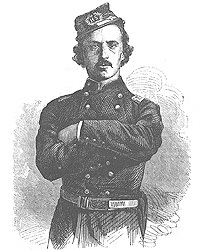 Allan Nevins, The War for the Union: The Improvised War, 1861-1862, p. 154. Ruth Painter Randall, Colonel Elmer Ellsworth, p. 163. Ruth Painter Randall, Colonel Elmer Ellsworth, p. 210. Rufus Rockwell Wilson, editor, Lincoln Among His Friends: A Sheaf of Intimate Memories, p. 91-92 (John Langdon Kaine, Century Magazine, February 1913). David C. Mearns, editor, The Lincoln Papers, p. 485-486 (Letter to Secretary of War Simon Cameron, March 11, 1861). Ruth Painter Randall, Colonel Elmer Ellsworth, p. 222. Ruth Painter Randall, Colonel Elmer Ellsworth, p. 224. Michael Burlingame, editor, At Lincoln’s Side: John Hay’s Civil War Correspondence and Selected Writings, p. 149. Roy P. Basler, editor, The Collected Works of Abraham Lincoln, Volume IV, p. 333 (Letter to Elmer Ellsworth, April 15, 1861). Michael Burlingame, editor, With Lincoln in the White House: Letters, Memoranda, and Other Writings of John G. Nicolay, 1860-1865, p. 44-45 (Letter to Charles H. Spafford, June 25, 1861). Harry E. Pratt, Concerning Mr. Lincoln, p. 81 (Letter of Elizabeth Grimsley to John T. Stuart, May 24, 1861). Charles M. Segal, editor, Conversations with Lincoln, p. 122-123. Charles M. Segal, editor, Conversations with Lincoln, p. 123. Michael Burlingame, editor, With Lincoln in the White House: Letters, Memoranda, and Other Writings of John G. Nicolay, 1860-1865, 1860-1865, p. 43 (Letter to Therena Bates, May 25, 1861). Michael Burlingame, editor, Lincoln’s Journalist: John Hay’s Anonymous Writings for the Press, 1860-1864, p. 70 (June 3, 1861). Michael Burlingame, editor, Lincoln’s Journalist: John Hay’s Anonymous Writings for the Press, 1860-1864, p. 356. Ruth Painter Randall, Colonel Elmer Ellsworth, p. 264. Michael Burlingame, editor, With Lincoln in the White House: Letters, Memoranda, and Other Writings of John G. Nicolay, 1860-1865, p. 43 (Letter to Therena Bates, May 25, 1861). Noah Brooks, Abraham Lincoln: The Nation’s Leader in the Great Struggle Through Which was Maintained the Existence of the United States, p. 272. Roy P. Basler, editor, The Collected Works of Abraham Lincoln, Volume IV, p. 385 (Letter to Ephraim D. and Phoebe Ellsworth, May 25, 1861). David C. Mearns, editor, The Lincoln Papers, p. 636-637 (Letter from E.D. Ellsworth to Abraham Lincoln, June 19, 1861). Rufus Rockwell Wilson, editor, Lincoln Among His Friends: A Sheaf of Intimate Memories, p. 95 (John Langdon Kaine, Century Magazine, February 1913). Michael Burlingame Editor, Inside the White House in War Times: Memoirs and Report of Lincoln’s Secretary: William O. Stoddard, p. 9. Geoffrey Perret, Lincoln’s War: The Untold Story of America’s Greatest President as Commander in Chief, p. 34. Walter B. Stevens, (edited by Michael Burlingame), A Reporter’s Lincoln, p. 132. Michael Burlingame, editor, At Lincoln’s Side: John Hay’s Civil War Correspondence and Selected Writings, p. 122-123.